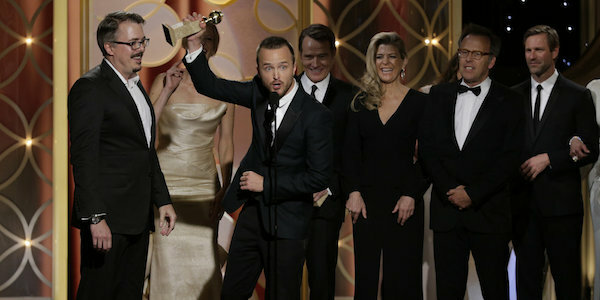 Breaking Bad and Bryan Cranston won, unfortunately, Aaron Paul didn't. Breaking Bad went out with a bang, earning itself a Golden Globe for Best TV Series, Drama for its final season, and another award for Bryan Cranston’s outstanding performance as Walter White. Unfortunately, while Aaron Paul was nominated for Supporting Actor, he was beat out for the award by the great Jon Voight, who won for Ray Donovan. Would’ve been great to see Paul win the award for his excellent portrayal of Jesse in the AMC drama, but it’s also hard to deny Voight’s talent, as was evidently the case for the Hollywood Foreign Press. Amy Poehler for the win! Poehler took time away from her hosting duties to receive a back-rub and a snuggle from Bono and then receive a much-deserved award for Best Actress in a TV Series, Comedy. As great as it is to see Poehler recognized for her outstanding performance as the lovable Leslie Knope, it was even greater watching her receive the award. 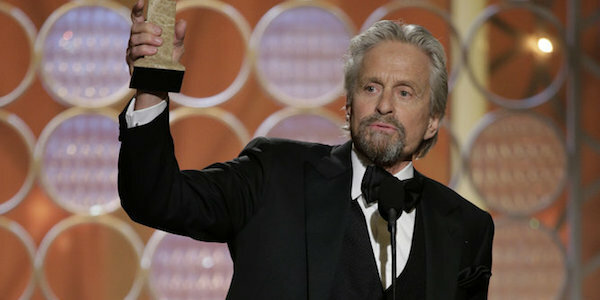 The Parks and Recreation star seemed beyond thrilled to have won. In fact, at one point, she seemed positively disbelieving and incredibly adorable. She was up against some steep competition too, with Lena Dunham, Edie Falco, Julia Louis Dreyfus and Zooey Deschanel also nominated for the award. 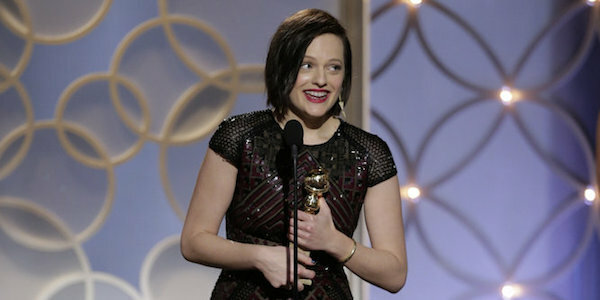 Elisabeth Moss Was on top of the world for her Top of the Lake win. While Mad Men was left off the nomination slate tonight, Elisabeth Moss still managed to make it to the stage, not for the AMC drama but for her role in BBC’s Top of the Lake, a miniseries about the investigation in a small town in New Zealand. Like Poehler, Moss seemed stunned and thrilled to accept her award. And the win is just one more reminder that I need to sit down and watch this miniseries, which I’ve heard is pretty fantastic. Each of the Best Actor awards went to the male lead in the series or TV movie that won in the Best Series/TV movie category. 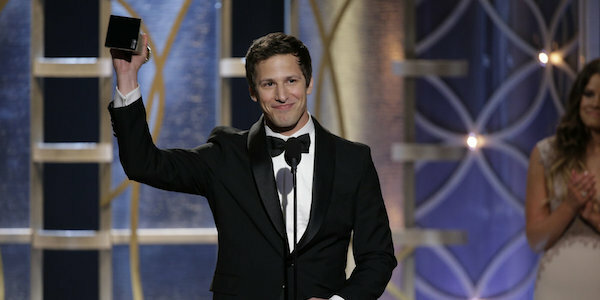 Andy Samberg won for Brooklyn Nine-Nine (Best Comedy), Bryan Cranston won for Breaking Bad (Best Drama), and Michael Douglas won for Behind the Candelabra (Best TV Movie/Miniseries). Not only did none of the female leads for the winning series win, but none of them were nominated. With that said, most — if not all — of the females in the winning series are supporting characters. Jacqueline Bisset won Best Supporting Actress in a Miniseries for the BBC series Dancing on the Edge, which aired on Starz, stateside. Meanwhile, Robin Wright beat out her Netflix competition Taylor Schilling for Best Actress in a TV Series, Drama. That was a tough category too, as she was also up against Scandal’s Kerry Washington, The Good Wife’s Julianna Margulies and Orphan Black’s Tatiana Maslany. I would’ve liked to have seen House of Cards take home more than one award, but it was great to see Wright representing the Netflix drama. And that about covers the TV categories. You can view the full list of winners here, and check out the list of movie winners here.